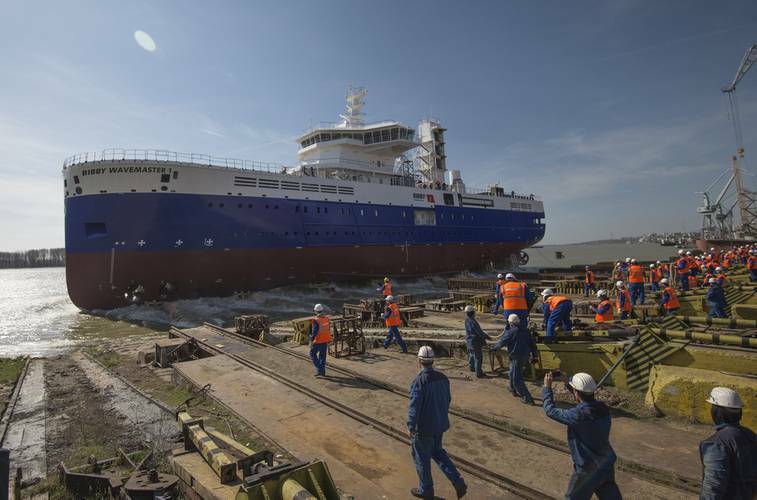 The service operations vessel (SOV) Bibby WaveMaster 1 was officially launched at Damen Shipyards Galati in Romania on March 24. 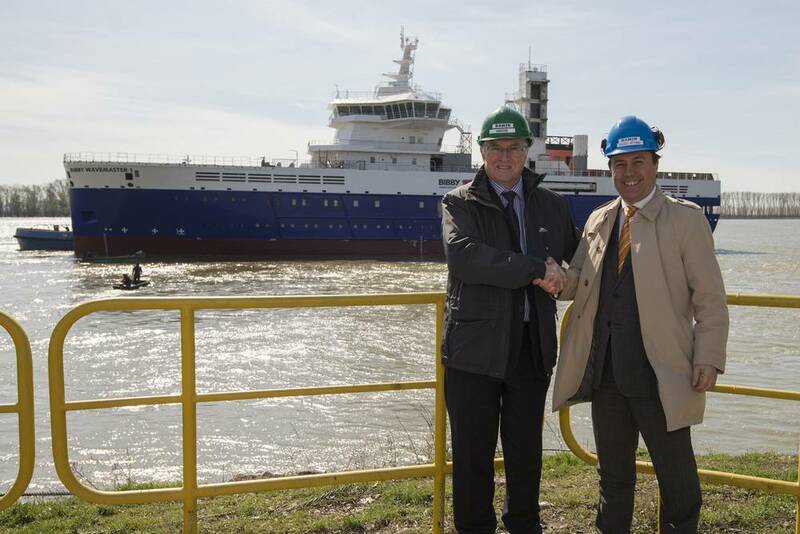 When completed, Bibby Marine Services Limited, part of Bibby Line Group, will deploy the vessel to support forthcoming offshore wind construction and O&M projects in the North Sea. The first of Damen’s purpose-built SOVs with walk-to-work (W2W) capability, Bibby WaveMaster 1 is built specifically for the transfer and accommodation of offshore personnel and aims to maximize working time, technician comfort and safety, the shipbuilder said. Equipped with DYNPOS (AUTR) DP2, the 90 m LOA vessel has a motion compensated access system (walk-to-work). 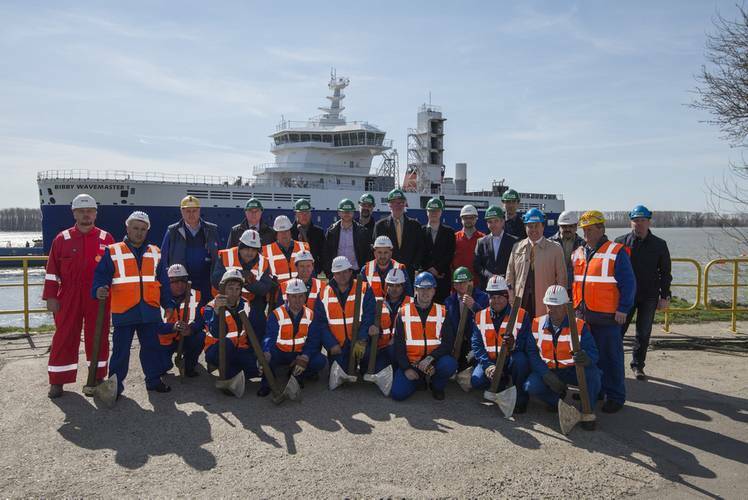 During the construction process, Damen has continued to work closely with the client in customizing the vessel in order to give it multi-sector versatility. This has included, for example, adjusting the design of the elevator to the W2W gangway. This now has six landings, meaning that technicians can directly access the gangway from the warehouse areas with a ‘stepless approach’. A helideck, daughter craft and CTV landings (with refueling) complement the vessel’s versatility. Also upgrading the vessel’s workrole flexibility, Damen has increased the POB to 90, from the 60 envisioned by the standard design. Taking into account the trend for wind farms to go farther from the shore in more challenging seas, the customized design provides fast, safe and comfortable access to turbines, and at a lower cost, including in worst case scenario severe Central North Sea conditions. This results in a vessel capable of providing turbine access up to 3.1 meter Hs. The Damen SOV is able to remain at sea for periods of up to one month at a time. During the two-year design and build period, when Damen and Bibby worked very closely together, a lot of attention has been paid to crew comfort on board the vessel. 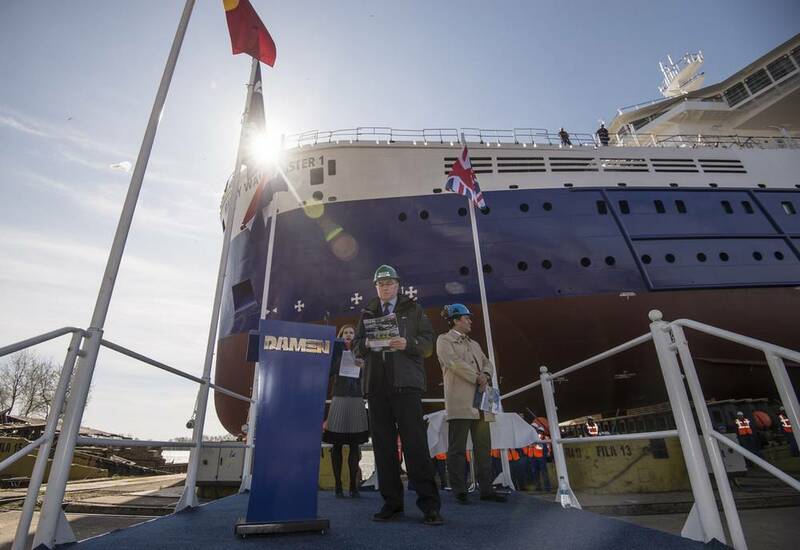 For example, the 90 meter hull is longer than that of a conventional platform supply vessel (PSV), this combined with the 20 meter beam and 4.6 meter draught, offers substantially reduced motions in every direction – resulting in improved comfort on board. Fuel efficiency is another key feature. The design includes a diesel-electric main propulsion system, which powers twin azimuth thrusters. 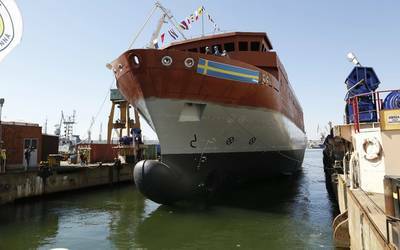 Thanks to careful development, the vessel requires less installed power than a conventional PSV. This results from two factors – a symmetrical wind profile and use of a four split main switchboard. Although primarily designed with offshore wind in mind in the case of the Bibby WaveMaster 1, the vessel is capable of a wider scope of work in a variety of offshore industries, according to the builder. A range of options are available including an additional deck crane with up to a 24 metric ton capacity, tanks arrangements suited to liquids such as glycols and low flashpoint liquids with separate delivery intakes, and facilities for dive support and ROV operations.